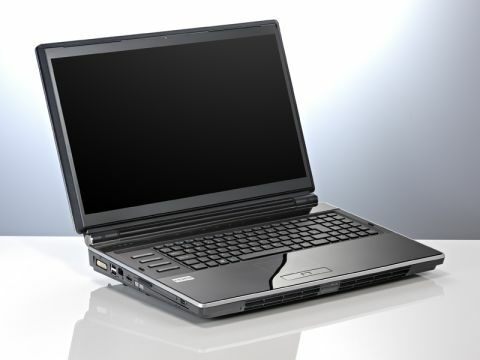 Novatech's top-of-the-range gaming laptop is a show-stopper in many respects. Firstly, it's got a massive 18.4-inch screen which looks absolutely sublime, thanks to its massive 1,920x1,080 resolution and bright panel. It is very glossy though so if the sun's out you'll get a lot of reflection. Then there's the power underneath the X1 Pro's chassis – it's an absolute beast, boasting many high-end components. The graphics are most worthy of note, the Novatech X1 Pro sporting a pair of Nvidia's finest GTX280 1GB graphics cards. When combined, there's nothing faster and as a result there's no game that the X1 Pro cannot handle. Whack the settings up to the max and anything you play will run like a breeze. The X1 Pro looks fantastic as well. It's a little more grown-up in appearance than the laptops you might get from other manufacturers, although this might make it a little too staid for some people, especially younger types. Turn it on and a Novatech logo on the lid glows blue, while above the keyboard touch-sensitive buttons along the top panel are highlighted in the same colour. The touch panel is a nice feature, especially the volume control that you can adjust with the flick of your finger, but it's practically impossible to adjust volume to its lowest point without turning sound off altogether. Speaking of sound, the X1 Pro's high-definition quad speakers are a little on the tinny side, which is disappointing when you consider that it'll probably be used either for gaming, or for watching hi-def Blu-ray movies using the X1 Pro's built-in Blu-ray player. This aside, the X1 Pro is a high quality machine which is perfect for gaming wherever you like, although don't expecting to be able to carry it in your backpack. It weighs a colossal 4.9kg and will always need to be plugged in while you're gaming, otherwise it'll run out of charge in about 10 minutes. The Novatech X1 Pro admittedly costs a huge amount of money, but its closest competitors – Dell's Alienware M17X and the Asus G71V – are more expensive when you compare a like-for-like specification, and as these only come with a 17-inch display, you could call the X1 Pro good value for money in comparison.